1Q84<ichi-kew-hachi-yon> is a 2009 novel by Haruki Murakami, published in two volumes in Japan. It quickly became a sensation and a best-seller, selling out the first printing within the first day of release, and eventually selling about a million copies within one month. To date, no English translation has been announced. 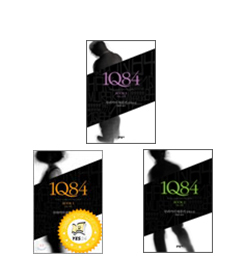 Some critics believe 1Q84's title is a reference to George Orwell's classic Nineteen Eighty-Four, as the Japanese word for the number nine is pronounced "ky?". One professor believes that the title is a reference to Lu Xun's novella The True Story of Ah Q. A certain one interprets the title as "IQ84" (intelligence quotient 84). Such speculation aside, 1Q84 is an intentional authorial reference to Orwell's novel, as well as being the name given by Aomame, one of the two protagonists, to the year 1984 which she is experiencing--a year out of time, separated mysteriously (a la Murakami) from the "actual" 1984. It has nothing to do with intelligence quotients or Ah Q. 1Q84 is described as a "complex and surreal narrative" which "shifts back and forth between tales of two characters, a man and a woman, who are searching for each other." The themes consist of murder, history, cult religion, violence, family ties and love.